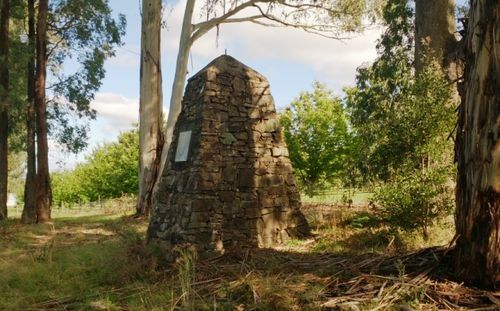 A cairn commemorates the Hume and Hovell expedition which passed through the area in 1824. The inscription on the plaque contains the last three lines of Tennyson's Ulysses. Albury, Thursday. At a meeting of the Hume-Hovell centenary celebrations committee it was reported that the soldiers' memorial on Western Hill would be dedicated on the opening day of the celebrations, Sunday, November 16. A special committee was appointed to provide entertainment for the pioneers who return to the town for the occasion. It is expected that there will be at least 7000 visitors for the week. Four hundred pounds' worth of bedding has been hired for the occasion, and the Drill Hall is to be mado available as sleeping quarters. The Town Council has applied £200 lor tho decoration of the mata streets. Several Victorian towns have arranged for shool excursions to Albury. The following programme has been adopted for the ceremonies along the explorers' route from Melbourne to Albury:-Saturday, November 15, leave Melbourne for Wangaratta; Nov. 16, leave Wangaratta for Chalet, Mount Buffalo, and unveil tablet at The Horn; November 17, leave Mount Buffalo and unveil memorial at Myrtleford, 11.30 a.m, at Everton 2.30 p.m., Murmungee 4 p.m., Stanley 6 p.m., reaching Beechworth the same night; November l8, unveil memorial at Back Creek, Beechworth, 10 a.m., at Allan's Flat at 11.00 a.m., at Staghorn Flat 12.15 p.m., Ebden at 2 p.m., Bethanga 3.30 p.m., reaching Wodonga and Albury the same day; on November 19 the party will attend the Albury ceremonies, and the first party will leave for Wangaratta. Sydney Morning Herald (NSW), 17 October 1924.